The Spring and Spring 1, 2019, Early Term Progress Survey will launch via the Student Success Portal on Friday, Jan. 25. This survey will be distributed to all Spring and Spring 1 U.S. on-ground and online courses and will be available for faculty to complete during a 10-day window that will close on Monday, Feb. 4. 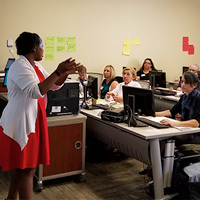 Advising and retention group Starfish returned to campus for a three day workshop to learn more about Webster University and our readiness, as an institution, to accept this new system and use it as a tool to help us achieve our student success goals as outlined in the strategic plan. The workshop consisted of focus groups, a leadership assessment and a workshop for colleagues to begin the work of building our system. The Faculty/Staff Mentor Program for First Generation Students is looking for interested faculty and staff members who would like to serve as mentors. The program will provide an understanding and supportive campus culture in which first generation students are welcomed and inspired to be successful. 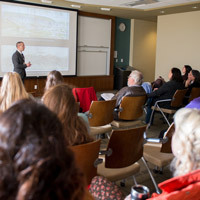 This year’s Spring Faculty Institute, around the theme, “A Holistic Approach: From Student Interest to Enrollment to Retention,” will take place Friday, April 7, 2:30-6:30 p.m. in Sunnen Lounge. The goal of the event is to develop further institutional awareness among the faculty about the process of securing student enrollment and seeing them through to graduation. RSVP by April 3. Helping students persist is an important part of what we all do at Webster University. Retention is important to the institution and to students who have invested in their education. If you perceive that students may be at risk of not continuing their education at Webster University, please alert the campus director. Early awareness of potential roadblocks can sometimes enable us to find an appropriate intervention that will enable students to continue their enrollment.